Don't have time to take a week or two off for vacation this year? Work bogging you down and bumming out your travel plans? Well, don't forget that weekend getaways are a perfect vacation of any sort. You just have to pick places that allow for such a trip. This article is to provide you with ideas on what types of weekend getaways you can take. Since, people all over the world read these articles, you'll want to customize the type of vacation with locations close to your home. I know it sounds like a teaser vacation, but a couple days away could be just what you need to let the stress wither away. If you live within a few hours of a beach or have the ability to take a cheap flight, then why not visit a beautiful beach and relax for the weekend. Sit around during the day in the sun, do some shopping, eat some good food, and enjoy time with your loved ones. This is a great getaway to sweep your loved one off their feet. We've all the seen the rich guy in the movie ask the pretty girl to dinner where he proceeds to take her in his private jet to an exotic island or first class restaurant in some romantic country. Well, it doesn't have to be that extravagant, but why not search online for a neat weekend spot like Paris, Italy, Chicago, New York, or any of your favorite vacation destinations. A lot of people do this instead of taking a week long beach vacation. There are many golfers, hunters, fisherman, white water rafting lovers, campers, and so on that love to do these activities over sitting on a beach. Go as first class as you want and stay in a beautiful cabin in the mountains or go rugged and camp underneath the stars. 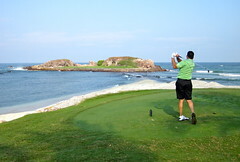 Play 36-72 holes within one weekend or take a charter and spend a couple of days out on the lake or ocean. I know this sounds crazy, but we love to attend seminars. Depending on your fancy they are a lot of fun! The speakers are typically motivating and interesting and you get to mingle with all sorts of people who have interests similar to yours. You never know, you might just meet some new friends. Plus you get to take a trip and enjoy the area you are visiting. Why not pamper yourself for a couple of days. Spoil yourself with a first class hotel that offers excellent room service and has a world-class spa with the works. You deserve it so treat yourself or loved one to total relaxation, rest, and pampering. Is your favorite band or singer playing in a nearby town?